Looking at our ancient archaeological history it begins to become clear that our view of human evolvement theory has a few flaws. You can’t hide or deny plain facts of which these are imprints in stone and bones archaeologists have excavated and they cannot be denied. 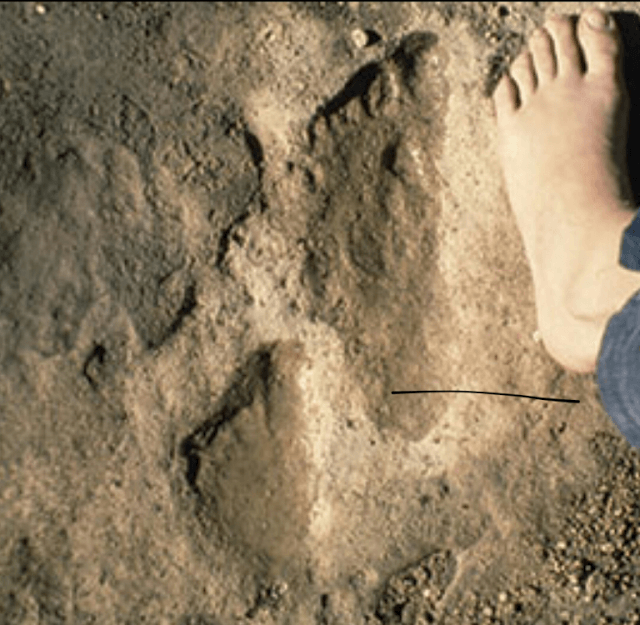 Some of the footprints date back millions of years and prove that a giant species of man roamed the earth at the time of the dinosaurs. This totally goes against the modern historical view of evolution where man evolved from apes. The footprint is located in South Africa, near the town of Mpuluzi, close to the Swaziland border. It is estimated to be between 200 million and 3 billion years old because of our current understanding of the formation of granites in Earth’s history. Some claim that the footprint is a natural erosion pattern. Personally I find that suggestion laughable. But to support my thoughts on this, Prof.
Pieter Wagener from the Nelson Mandela Metropolitan University in Port Elizabeth SA, and a PhD in applied maths, suggests that “there is a higher probability of little green men arriving from space and licking it out with their tongues, than it being created by natural erosion”. This amazing footprint in granite was discovered in 1912 by a farmer called Stoffel Coetzee, while hunting. At that time this was a deeply remote part of South Africa known as the Eastern Transvaal. The possibility that this was a carved hoax is extremely low because of its remote location. One of the most important archaeological discoveries was made at the Qumran Caves over half a century ago. Among the artefacts discovered were thousands of antique scrolls that offered extremely important insight into our past. Many of these scrolls helped complete a lost fragment in Earths history. But in addition to the numerous scrolls, archaeologists were surprised when they stumbled across one rare and unusual texts: an ancient scroll that describes the demise of the ancient Nephilim. Called the Book of Giants, it speaks about the creatures that inhabited our planet in the distant past, and how they were destroyed. Here a short extract of reconstructed text from the book of giants. “I am a giant, and by my mighty strength in my arm, I can vanquish anyone mortal. I have made war with them (mortals) in the past but I am not now able to stand against my opponents who reside in heaven, and dwell in holy places. “I have been forced to have a dream… The sleep of my eyes vanished so that I could see a vision. [Now I know that on the field of battle we cannot win.] Gilgamesh — note!” (Ohya describes his vision. 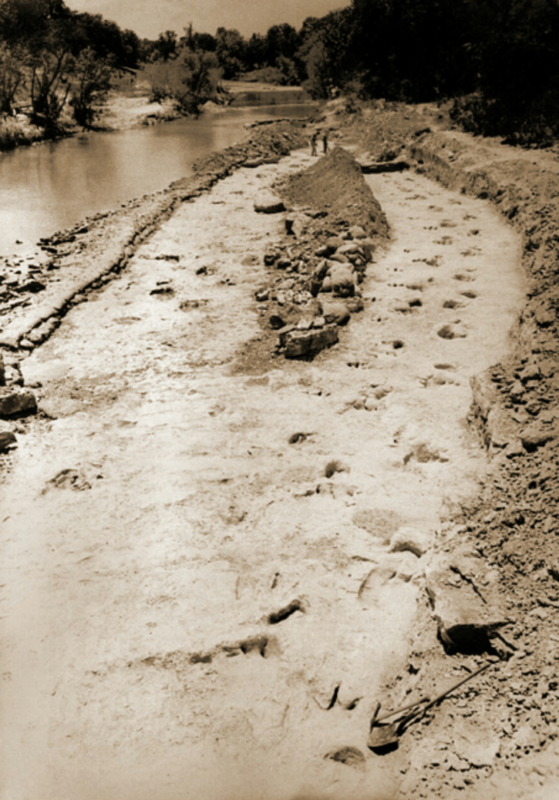 A few individuals such as Carl Baugh, Don Patton, and Ian Juby, continue to promote the Paluxy “man tracks” or alleged human tracks in Mesozoic or Paleozoic from other localities, but such claims are not considered credible by either mainstream scientists or major creationist groups. When examined thoroughly and carefully, the Paluxy tracks not only provide no positive evidence for young-earth creationism, but are found to be among many other lines of geologic evidence which indicate that the earth has had a long and complex history that is still overlooked by modern scholars. When I first looked into the dig sites I was amazed how many giant bones had been unearthed. The cover up and ridicule of course follow any discovery in this field. Why? Are those elites covering up again or are the academics so wrapped up in their own self importance they cant admit they are wrong? Its time to rewrite ancient history or realize what we are taught is incorrect. It’s time the world woke up to the fact our history is flawed. The reason for this information coming to light can only be due to the internet. Now we are seeing myth becoming fact. The korlbrin, the bible and apocryphal text are only some of the recordings of giants through Ancient text. Most is written off as myth. What was really interesting is how the texts point to them creating the great temples of old. Could they be the builders and architects of the megalithic structures we see on the earth today? It is a definite possibility.